Wear and travel with Anna: Vote for Bobby Raffin and Win the Lookbook.nu Board Game!!! Vote for Bobby Raffin and Win the Lookbook.nu Board Game!!! Radzę się pośpieszyć, bo giveaway kończy się 18 marca (w poniedziałek)!!! Hurry up, the contest and this giveaway will end on 18th (Monday)!!! 2. Zostaw pod tym postem komentarz z Twoim adresem e-mail. 2. Leave the comment with your e-mail under this post. Zwycięzca giveaway dostanie nagrodę (Lookbook.nu the board game) od Bobbiego Raffina! 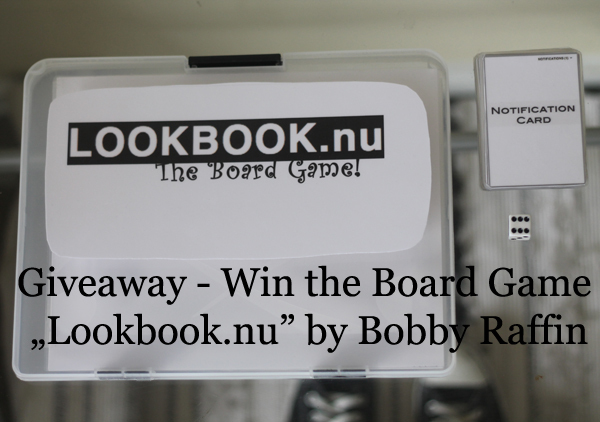 The winner of this international giveaway will win a prize (Lookbook.nu the board game) from Bobby Raffin! ciesze sie razem z Toba. Gratulacje ! I've been voting for Bobby! He so deserves to go - he's rock'n'roll! I've been voting for Bobby everyday - HE so deserves to WIN! Great pants. I love the print. I've been looking for a pair myself. Haven't had any luck. I found a skirt at BEBE's. If you get a sec, check out my latest post 'One Shoulder Wonder'. A very pretty LBD dress that I found last weekend. I would love to hear what you think about it. Nice idea. Have a great friday. loll i still want the galaxy leggings. oh well. sound so much fun so i am joining! Fun giveaway! I like him!! haha I just love, Bobby. Great giveaway. Looks lik a fun game. Ahaha such a cool game!! What about following on Facebook and Bloglovin too? We follow you back on Bloglovin! It's a so great and interesting giveaway! Swietne te leginsy, z przyjemnoscia pomoge w spelnieniu marzenia, szczegolnie ze sama jade na Coachelle! !